We always receive such a diverse array of entries for The Spice Trail, and this month’s caraway challenge has been no exception. Jacqui from GoodFoodSeeking is working her way through a 1948 Good Housekeeping cookbook she inherited and is blogging as she goes. After seeing pretzels being made in the Great British Bake Off she rather fancied trying some herself and was delighted to come across a recipe in the Good Housekeeping cookbook as a German bake in the ‘world’ chapter. I think they look absolutely wonderful, especially with that sprinkling of caraway seeds on top. These shortbread hearts from Sarah at Tales from the Kitchen Shed are a perfect Valentine bake and look absolutely divine. I’ve never combined caraway with chocolate but it sounds like a wonderful match and, as I’m a sucker for salty-sweet foods, it’s a recipe I plan to try out very soon. Lou from Eat Your Veg brings us these creative Kale and Caraway Crisps next. She says she often sautees kale or other greens as a side dish for Sunday lunch and throws in a generous pinch of caraway at the end. So when Lou was considering how to flavour her first ever batch of kale crisps, caraway was the obvious choice. “By heck they were good,” is Lou’s brilliant response to these surprisingly moreish, healthier-choice crisps. Although Alexandra from The Lass in the Apron disliked caraway as a youngster, it is one of those flavours that she has grown into over the years. After she graduated from pastry school, Alexandra worked in a German bakery where she found herself eating lots of the stuff. Alexandra was keen to make something Scandinavian for this month’s Spice Trail and has adapted a havreflarn recipe, a sort of oat tuile, using caraway as well as cocoa and orange. Don’t they look simply incredible? I don’t always include caraway in my Bolognese. In fact every time I make spag bol the ingredients are different, all depending on my mood and what we have in the house. But caraway is a surprisingly good addition, and adds a beautifully intense and slightly sweet flavour to the sauce. Martin from Spurs Cook has also used caraway to flavour a pasta dish, this time an ingenious hybrid of two classic comfort foods – pasta bake and cauliflower cheese. Also featuring leeks, red onion, garlic and bacon, I think this could rapidly turn into a family favourite in the Bangers & Mash household. I really should have baked rye bread for this month’s challenge, as it is of course the loaf synonymous with caraway, but I’m not sure I’d have persuaded the rest of my brood to eat rye bread just yet. I’ll be working on them. In the meantime, this caraway and linseed bread did go down very well, which is absolutely delicious served with soup or cold cuts and spread thickly with good, salty butter. I find it impossible to look at this photograph from Karen at Lavender & Lovage of her Polish Sausage & Sauerkraut Casserole with Beer without drooling. This is my perfect kind of meal and I am just so thrilled Karen entered it into this month’s Spice Trail, as we really couldn’t have a caraway challenge without some sauerkraut in there. She made hers in the slow cooker but I know it will work just as well in my Aga or any conventional oven whacked right down low. Finally, I couldn’t run a caraway challenge without sharing (again) my Braised Pig Cheeks cooked slowly in red wine and vegetables and flavoured of course with caraway. It really is so good and is what I consider to be the ultimate in classy comfort food. So there you have February’s fantastic recipe round-up. 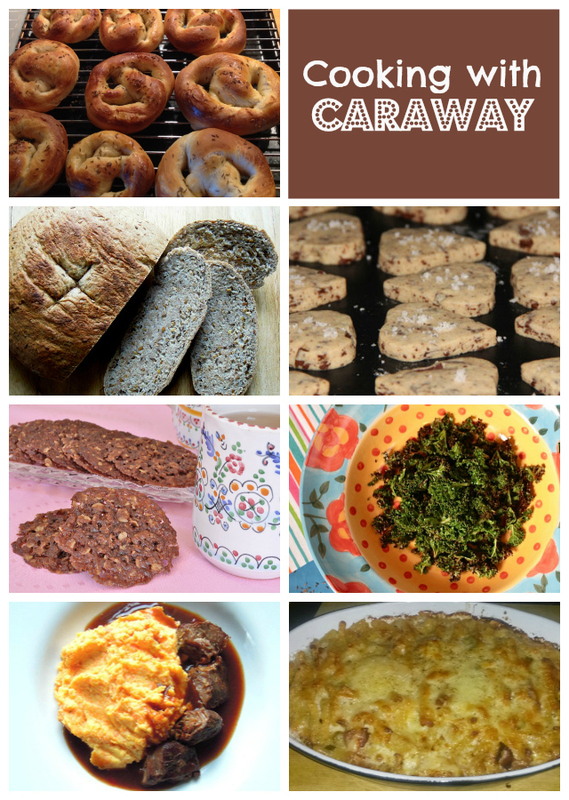 Huge thanks to everyone who entered their recipes; I have been genuinely inspired by your creativity with caraway! But who will take the crown as our caraway king or queen? That decision was made by Lara Light-McKelvaney from Bart Ingredients who are providing this month’s prize, a wonderful gift bag containing fabulous Bart’s goodies. And Lara’s decision? It just had to go to Jacqui Gourlay from GoodFoodSeeking for her brilliant Caraway Pretzels, which Lara says look incredible. Congratulations to Jacqui – a very worthy winner, don’t you agree? A Bart Ingredients gift bag will be on its way to you very soon – enjoy! If you’d like to find out more about Bart Ingredients and shop online, do check out their new Bart Market, where all their products are now available, showcasing an impressive array of spice blends from around the world, spice infusions, individual herbs and spices and other associated cooking products. I feel like a child in a sweet shop whenever I’m on there! What a brilliant surprise! I’ve never won anything ever before so this is great. Thanks! I struggled to come up with something for the ‘caraway’ challenge but a great round up for future inspiration. I have to agree that Jacqui’s pretzels look delish. You had a lot of pretty inventive recipes this month Vanesther. I was going to make charcuterie, but I ran out of time this month. Never mind, I still have the recipe to try, so I’m sure I’ll blog about it some month. Hi, I have recently started using Caraway spices in my meat dishes- couldn’t live without it now!